We all know that kitchen renovations are usually the biggest expense when it comes to updating your home. Also, anyone who has been house or apartment shopping knows that, for some odd reason, the kitchen is always the room that seems the most dated! That’s why it’s especially important to make sure that when you are designing a kitchen, you design it to withstand the test of time - both aesthetically and functionally. Today, I’m giving you my top five tips to design a timeless kitchen! A functional kitchen never goes out of style - and better yet, you won’t be dripping water and dropping food on the floor as you pace between the cutting board and the stove while you cook! Be efficient with your layout. Make sure the dish washer is next to the sink, and include a clear, spacious area to prepare your food. If you’ve ever heard of the golden triangle, apply that design concept to your kitchen appliance layout as well! The sink, stove, and fridge should create a triangular shape, and should be no less than 4 ft and no more than 9 ft apart from each other. This will create the optimal flow when navigating your kitchen while you are cooking up a storm! When choosing finishes for your kitchen, you want them to be both durable and timeless. That means stainless steel appliances and white countertops! 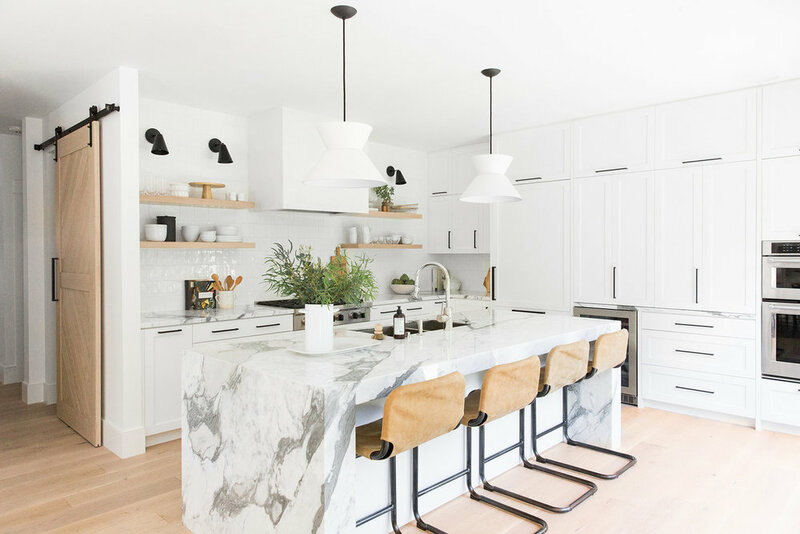 Although I am partial to a Carrara marble island, if you have one in your own home you need to be prepared and excited for the extra care and attention it takes to keep it stain free. Some great durable alternatives to marble are Quartz and Granite, which are both resistant to scratches and heat. As with most stones, proper finishing and care will make your stone last for years - and the finish you choose is almost more important than the material itself! Flooring is one of the most important parts of a well-designed kitchen! If the kitchen is the heart of the home, that means it will be getting the most wear and tear from your family on a daily basis. Whether it’s your kids running to the fridge to get a snack or you and your partner breaking out for an impromptu dance session between stirring, you’ll want to make sure your floors can withstand anything. Some great options are natural stone, porcelain tile, or prefinished hardwood. Natural stones like granite, limestone, marble, slate or travertine are great options for your floor. And since these stones are naturally cool, if you have it in your budget, getting a heated floor board beneath is a wonderful way to make sure you don’t get cold feet while cooking! However, if you are looking for the most durable flooring with the lowest maintenance required, choose porcelain tile. Prefinished hardwood floors are also timeless, beautiful and create a unified look in open concept floor plans. And keep in mind, the finish on the hardwood is extremely important to make sure moisture in the kitchen doesn’t warp or stain the floor! When it comes to cabinets, you’ll never regret shaker style cabinets made with clean, simple lines that will never go out of style. They should be the backdrop for the rest of the kitchen and not stand out as a stand-alone feature - that’s what the island and backsplash are for! 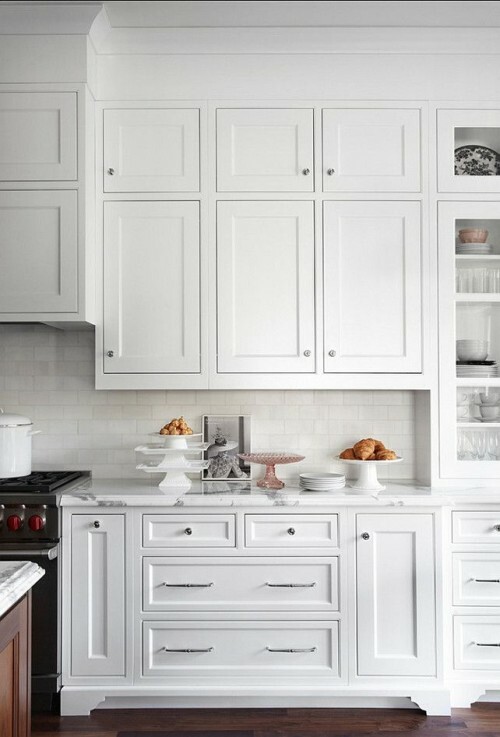 You can also mix up a wall of cabinets with glass or open shelving to show off your favorite dishware and glasses. Having ample and proper storage and organization for all of your kitchen items is essential to a well-designed kitchen that lasts! You’ll never complain that your kitchen is TOO organized, so invest in some custom drawers or fun organizers from The Container Store, and make use of every inch of your space. The ability to keep your kitchen visibly uncluttered is going to be essential to not only its aesthetic, but its function as well! So there you have it - 5 tips to help you design a kitchen that stands the test of time. Not only will this create a kitchen that you’re proud to host and spend time with your family in, but this will undoubtedly add value to your home if you decide to sell a few years down the road! Remember, never make big design decisions like designing a kitchen, without planning ahead and making sure you utilize the tried-and-true practices used by designers and contractors to make sure your investment stands the test of time! 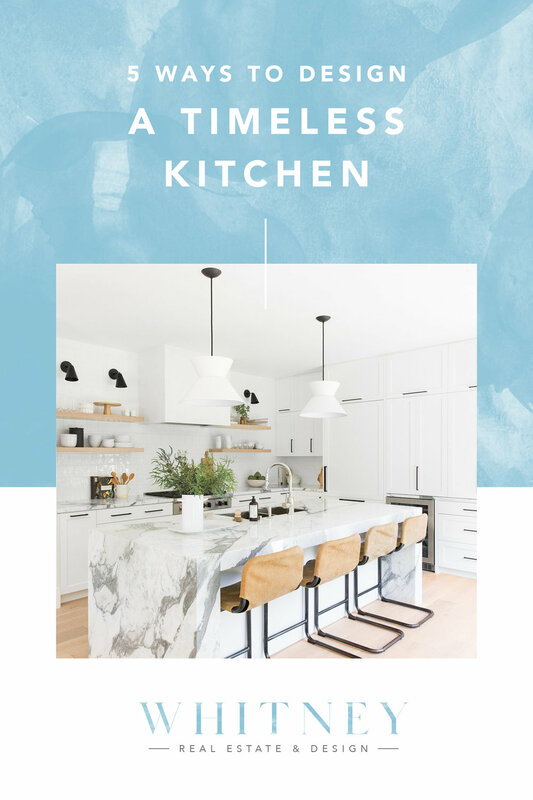 Tell us in the comments below what your favorite timeless kitchen tips are, and if you want to hire a designer to turn your dream kitchen into reality give us a call! Schedule a Consultation with Nicole!